Meals were excellent - just pick anything from the menu at local restaurants. Usually the best in town. Support was excellent. All the Cytomax, gu, bars you could want. The course route was challenging. That's what I was looking for. I know you probably get tired or more like board of people telling you how great your company is, but I am so impressed at what you have done that I feel compelled to tell you yet again. Arizona - with its cripplingly beautiful sunsets that light the western sky on fire and desert roads that stretch for miles. 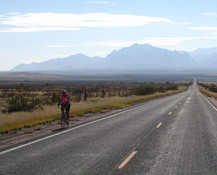 This bicycle tour starts and ends in Tucson, Arizona. The mild winters and endless sunshine make Arizona the perfect winter riding wonderland. Our spring and fall tour loops around southeastern Arizona through cactus and Joshua Trees, as we climb stark desert mountains on our way to New Mexico and back. On the way we visit some of the historic boomtowns of the southwest, including Bisbee and Tombstone, the "The Town Too Tough To Die." 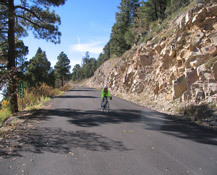 On this bicycle tour we meet in Tucson, Arizona on Sunday morning and start riding after a brief orientation. We meet at the Sheraton hotel, directly across the street from the airport, so the shuttle ride is short if you are flying in! We recommend you stay at the hotel the night before if you are flying in to Tucson. 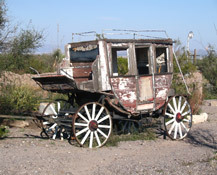 On day one we ride desert backroads from Tucson to Tombstone, site of the Gunfight at the OK Corral. We'll climb up through the Whetstone Mountains after passing through the sleepy town of Sonoita. The road stretches out before us, twisting and turning as it makes its way toward the distant mountains. After passing by Sierra Vista we'll descend into Tombstone and it's legendary ghosts. 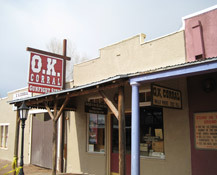 Take time to visit the OK Corral, Big Nose Kate's Saloon and the famous Boothill cemetary. the Copper Camps." With a mining life of almost a century and a peak population of 35'000, Bisbee attained a permanence rare among mining towns. The town is carved into the cliffs and still looks like it's photos from a century before. Day three finds us heading toward the New Mexico border on our way to Lordsburg. We'll have big views on our route today. Watch the road stretch out 30 miles in front of us as it snakes across the valley. We stop for lunch at Geronimo's Monument, which marks the spot where Geronimo surrendered to General Nelson Miles on Sept. 6, 1886. The surrender of Geronimo ended Indian warfare in the US. 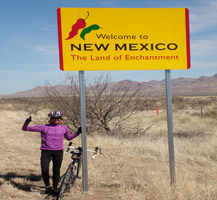 Today we leave New Mexico and ride back into Arizona, heading toward the mining town of Safford. The route has numerous historical markers testifying to the danger involved in traveling this way a century ago. Indian raiders were common and more than a few lives were lost along the way. The only threat to us is 10,000' Mount Graham looming before us on the horizon. An island in the sky. The Arizona desert landsape is frequently interrupted by "sky islands" -- mountain ranges that support temperate and alpine habitats by absorbing rainfall at the expense of the surrounding flatlands. The Pinalenos are the highest sky island in Southern Arizona. Mount Graham, the highest peak in the range, is 10,720 feet above sea level and rises over 7,000 feet over the nearby town of Safford. It's said that Mount Graham has more climate zones than any other single mountain in North America. And we'll ride through all of them. 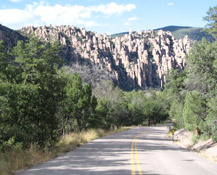 On the last day of our cycling vacation we ride into Chiricahua National Monument, an awe-inspiring collection of precariously balanced stone monoliths, deep canyons, sky-high spires, and colossal columns. Known as the "Land of Standing-Up Rock," this park is a little known gem hidden in the southern Arizona mountains. Threaded with dozens of miles of trails through fantastic rock formations, this park is the product of eroded lava formations from the eruption of the nearby Turkey Creek caldera thousands of years ago. After lunch in the park and a short hike into the rocks, we'll finish our ride and then shuttle back to Tucson, arriving around 5:00pm. Lunch on ride days is always included. On this Tour two group dinners are included and riders are on their own for the remaining, with suggested seating times for those wishing to dine with others. A continental breakfast is always included of Greek yogurt, a selection of natural cereals, Bagels, cream cheese, etc. Hot breakfasts are on your own and require eating early in the Lodges.